A dense, polished, durable marble with creamy background tones and beige veining. 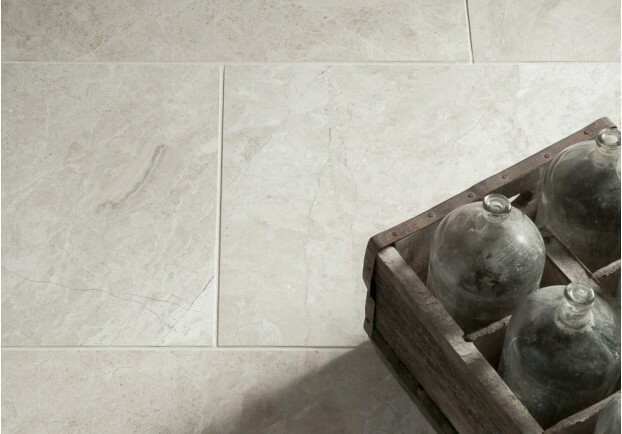 A dense, creamy stone with distinctive veining and quartz detail. Whilst the background colour is predominately cream this marble also contains beige, tan and grey tones which blend together to create a striking, swirled marble pattern. Occasional ivory and quartz veins create added interest to this popular marble tile. The polished surface of this stone will reflect the natural light of a room, giving a modern, elegant finish. Marble is a classic stone, often seen in grand buildings and is now an affordable option for your home. Loved for its rich patternation with contrasting veins, quartz and mottling, marble is a luxurious stone that adds sophistication to any interior space. High gloss and honed varieties exude quality whilst tumbled tiles have a more rustic, soft finish.